K T K works in a greyzone between sound, image and architecture. With multiple monitors placed around the room, and a wide variety of sound objects, K T K creates an immersive, audiovisual space. 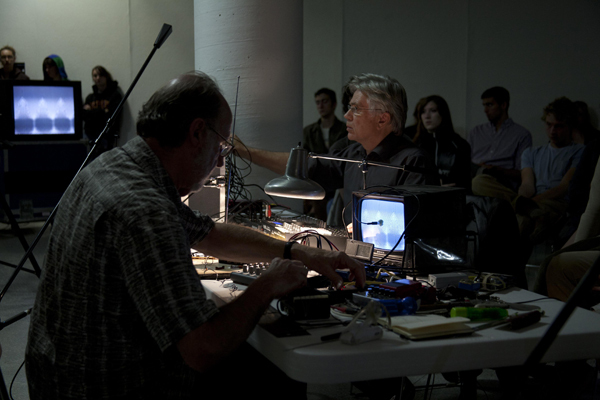 The video is generated by sound signals: both by Kjell Bjørgeengen’s own Doepfer system, and by the sounds provided by Kim Myhr and Tor Haugerud. Bjørgeengen has extensive experience in working with sound. Throughout the years he has worked with different musicians such as Evan Parker, Svein Finnerud, MIMEO, Marc Ribot and in particular Keith Rowe. The sound work of improvisers Myhr and Haugerud bring new elements to Bjorgeengens video, and together they create a forceful, audiovisual ambiguity. Kjell Bjørgeengen & Keith Rowe: Porto VI 6.44-10.44 (Excerpt) from The Wire Magazine on Vimeo.